I am beyond excited to bring you this post today; I hope it's a hit with you, too. 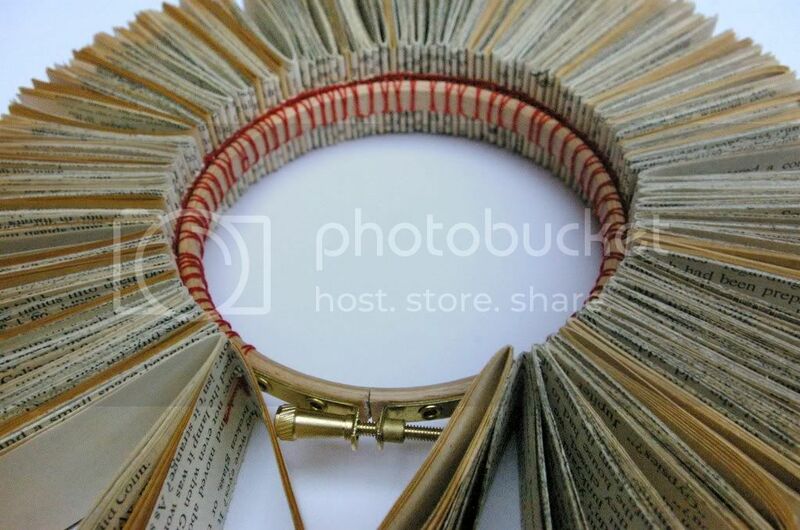 During one of my Etsy romps, I ran across Paperfaerie, aka British artist Yvette Hawkins. Initially, I was going to feature Yvette's wares as one of my Etsy gems, but as I looked through her designs I wanted to know more about her, and I suspected you would as well. 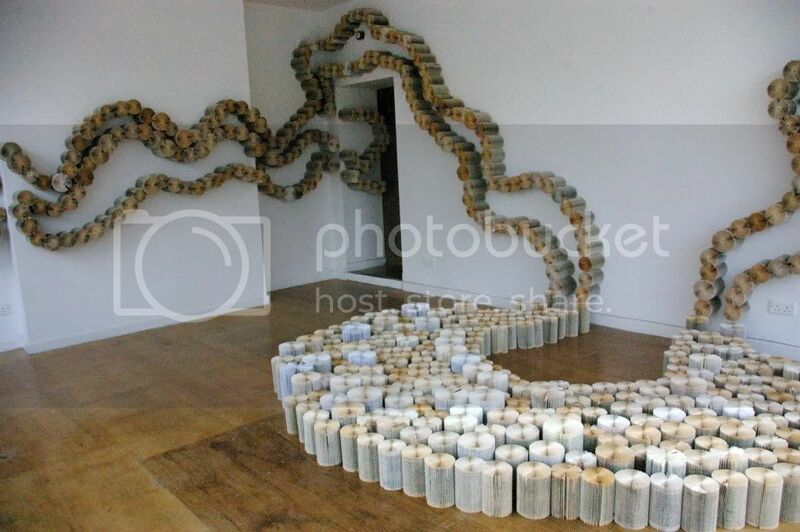 Yvette creates incredible sculptures and installations out of humble paper and pages, ranging from miniature pieces to works that fill entire rooms. Her work is available for purchase from her Etsy store, and you can learn more about her at her website and on her blog. booklicious: Did you always want to be an artist, or was it something that just kind of happened as you grew up? yvette: I have always always wanted to be an artist. It was the thing I decided to do when I was about 5 and started to draw. I was completely obssessed with my brother's Crayola tower, filled with felt tip pens, crayons and paints. I was never allowed to touch it, then I managed to get hold of my dad's biros and pretty much drew on everything I could lay my hands on. b: Why paper and books? y: The thing I love about paper is the idea that something so fragile and one dimensional can become structured and sturdy just by folding it. 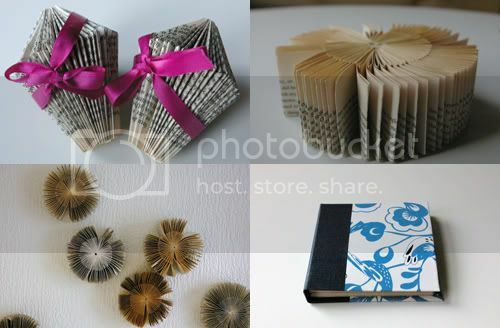 I actually started folding books because I wanted to manipulate the way printed words can be seen, so although i have always loved to work with paper, it was mark making and print that drew me to books. b: Where do you get your ideas and inspiration? y: I'm not sure. I guess they come from a variety of sources. I like to use minimal colour palettes with my installations, and I am drawn to structures and forms in architecture, grids, maps and molecules and also the geometric forms found in nature, like cobwebs. I'm also inspired by repetition, and the sort of work I tend to really appreciate have an awesome sort of quality where I think, "how did they do that?" or find a way to completely immerse the audience. Conrad Shawcross' sculptures in particular come to mind, where I really appreciate the scale and engineering aspects of creating work. b: How do people react to your pieces, especially the larger ones, when they see them for the first time? 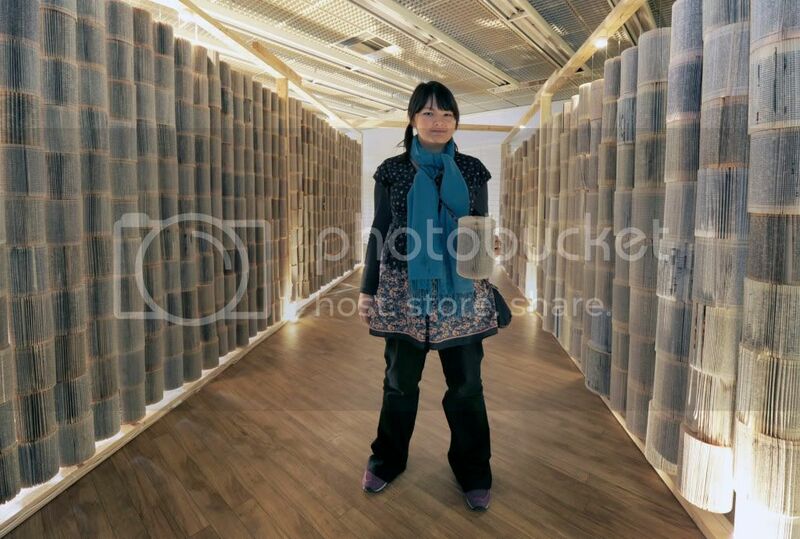 y: I've had some great feedback with the larger installations; people find them unexpected. Some are fascinated by the amount of work that goes into folding 1,000 books, which I really appreciate. I like to think that the work is inviting and engaging to people who might not normally go to a white cube gallery space (A lot of my installations are in non-gallery spaces like empty shops). I have also had some negative feedback, with the nature of "ruining" books and have been challenged at workshops I've ran. Often they'll say "You're not coming to my home." People are very protective of their books, and I hope in some way, the work that I make helps people to relish their favourite books even more. b: What's your favorite piece? y: It's hard to say. With the repetitive nature of folding and sewing, I really come to build a relationship with the sculptures. I'm very proud of the new pieces I made for The Gallery of Wonder Show, which were even more labour intensive than the large-scale installations. However, I think my favourite piece is Their Silence is a Language, because of the way it was lit; it really immersed the audience in an intriguing viewing experience. b: Is there something special about the books you use in your work, or do you pretty much use whatever you can find? Where do you get the books from? Do you ever feel guilty about dismantling them? y: The books I use are forgotten or lost; they're often charity shop finds or ones libraries can't sell off. They are also donated by people all over the country or come from secondhand book shops. I like to think I am perhaps reinvigorating the books' lives. I would feel guilty about dismantling a treasured book (I have a bookcase full of 'not for folding' books). But the books I use don't have a special relationship with me, so I think that is OK. I stop thinking of them as books but as objects or as my material, like clay might be to a sculptor. b: Do you have any upcoming shows or projects? y: The next project for me is an installation in a new brasserie restaurant in North Shields, UK. I really enjoy bringing my installations into new environments. I'm also taking part in a group exhibition in a beautiful church, which is being renovated into artist studios in Gateshead. I'll be previewing some completely new work based on geometric folding, which I'm really excited about. I hope it will add another dimension to my practice. b: Any new products for your Etsy shop in the works? y: I'm planning a rebranding of my Etsy shop with a new line in lighting, artist books and paper jewellery. I'm very excited about it. b: Tell us a little bit about your personal book habits - are you a big reader? What genres and authors do you like? Got a favorite book? y: I must admit, I have a ritual that I must read the first and last line of any book before I commit myself to reading the full thing. I treat them as codes, trying to piece the beginning with the end. I've never worked out the ending yet, so it's never really spoiled any stories for me. I also read children's poems and folklore to my boyfriend at bedtime every night, and I'm always looking for new folk tales and rhymes to discover so please pass on any ideas! As for favourite books, well, I love classics like The Great Gatsby. The last great book I read was The Sleepwalkers' Ball by Alan Bilton. In fact, you can read my review of it here.